Rabbit and Lilly star in the latest issue of ELLE Decoration. Rabbit’s been in the press again. 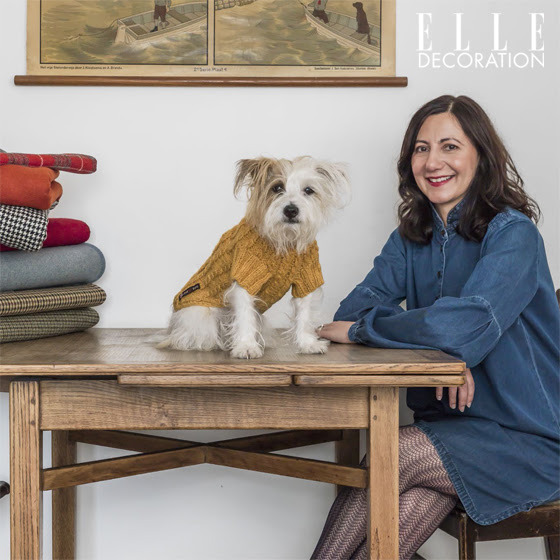 Here he is photographed for ELLE Decoration whilst wearing his Yellow Wilmot Dog Jumper. Much copied, the Wilmot is the original chunky dog sweater that launched a thousand imitators. Each Wilmot dog jumper is hand-knitted in a traditional cable knit, with ribbing at the neck and shoulders for that retro look. Created from top quality pure natural wool, this jumper is gorgeously soft and much warmer than horrid acrylic fibres. They’re easy to slip on and feature a special loop hole so they can be worn over your dog’s harness. Plus, because we use the finest quality pure new wool your dog stays dry even when you’re caught in a light shower. The latest copy of Elle Decoration is out newsstands now. Find out more about the current issue.